Over 70 years ago, York Barbell began its journey to shape up the fitness industry through productive design, competition,education and athletic sponsorship. It was also known as “Father of World Weightlifting” by the International Weight Sets Review lifting Federation, Bob Hoffman was the founder of York Barbell in 1931 and immediately began involving new ideas in many of today’s accepted exercise methods. York applied an original innovation with the standardsof multi hole grip plate and manufactured the “ISO-Grip” Plate, clearly the most easiest, safest plates present in the gym equipment today. The ISO-Grip Plate consist of a 360 degree easy pick up design which is made by casting or molding the hub thicker than the rim. The easily pending, natural benefit of a broad beefy hub with a streamlined rim is the anti-pinch nature of using the plates. The streamlined rim provides a comfortable grip and increased maneuverability with its three grip design. The complex casting protects the structural integrity of the ISO Grip Plate. The Legacy Olympic Weight Set with Barbell by York Barbellconsist of a feature having 3-grip plate with 360degrees easy pick up. 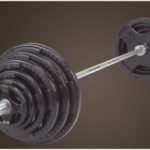 Plates comes in a standard size and their two inch holes make them feel compatible with all York Olympic bars. York USA Olympic bars are one the leaders in the market. Each gives a life time guarantee, and represents44 lbs. of expert craftsmanship. Each of the Olympic bar is manufactured in a controlled temperature to draw alloy steel. 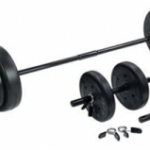 The Legacy Olympic Weight Set with Barbell by York Barbell, are high quality set which comes in 300lbs. 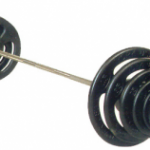 of weight plates and Olympic spring steel collars for securing them to the metal bar. The Olympic barbell has further 700 lbs. weight capacity to add on. In one set of Legacy Olympic weight set, there are two 45lbs. plate included with, two 35lbs. plate, two 25lbs. plate, two 10lbs. plate, four 5lbs. plate and two 2.5lbs. weight plates are included in a set which gives them a total weight of 300lbs. approximately. Along with that there is one, seven inches long International Chrome bar with split sleeves and one pair of Olympic Spring collars to hold the weight while lifting. The ISO Grip plate consist of two types, One is steel composite and the other one is of same material but covered with Rubber. Though the rubber Encased steel plate are especially used by professionals for Crossfit. Hence, they are bit more expensive too. The material used in the manufacturing of plates is pure cast iron and are painted black. The weights are a bit expensive because of this but looking the company’s prestige in mind York has been quite successful around years for producing high quality weight. They are having a standard lip that most of the people use to grab the weight is provided by York and the name of the company along with weight amount is also written with white paint on the plate. These are things which you’ll expect from a basic, old school 300lbs. Olympic Weight Sets Reviews . The ISO plates comes in a black color having a gritty finish and they have comfortable gripping handles at 10/2.The big York emblem with white lettering and the opposing finger hold, though there is no grip present there, gives the plate a decent look. The interlocking from barbell are very much obvious and they’re quite different from other plates just at first look. The gritty look is good, but the paint on them is not up to the mark and looks very cheap on these high quality plates. There is a tiny bit of rust in most of the plates as reported by many users and about 60% of the plates lettering paint was sloppy and terrible. Hence, using WD40 will prevent the plates from rust. The gripping of the plates is very nice but it’s functionality not that much different than any other plates. 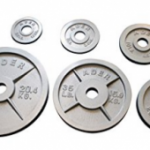 Plates are made on comfortable weight for normal uses, though you won’t find many issues with the plates because they settle very easily on to the bar. The individual fingers spacing and gripping on ten inches makes the plate easy to handle. In one set there are two 45 lb. York ISO-Grip Plates; two 35 lb. York ISO-Grip Plates; two 25 lb. York ISO-Grip Plates ; two 10 lb. York ISO-Grip Plates ; four 5 lb. York ISO-Grip Plates ; two 2 1/2 lb. 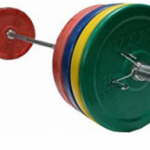 York ISO-Grip Plates ; one 7′ Legacy Olympic Chrome Bar with Split Sleeves ; one pair Olympic Spring Collars. 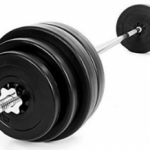 York Barbell name is synonymous with weightlifting. 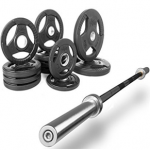 York Barbell has consistently maintain the standards in product design, performance and value. In my opinion, buying Legacy Olympic Weight set was one of my outstanding purchase. It is the best fitness decision I have ever made of gettingthese and putting them in my gym equipment collection. Since, I’ve purchased them I didn’t even missed or skipped my workout yet, which was one of my big problem of not being consistent. The reason for this is that, it’s very tough driving to the gym but having these traditional looking old school weight set in my next room didn’t gave me a chance to show laziness and all. The plates and components came in exact size and measurements which was stated on Amazon. The bar’s weight was 45lbs. the exact weight which you find at any gym. The delivery was very quick and efficient. The only issue I faced was, when the package arrived the Weight Sets Reviews 2017 were clustered up in bundles without having a proper padding in between to prevent them from getting scratches and scraps. So that shinny look of paint scrapped out from most of the places. Though if you are using them for lift, then paint shouldn’t be considered much but in my opinion the actual design and looks do matter from a high standard company, York Fitness. Thus, these plates have comparable grips which looks very good and are pretty easy to handle around. Overall, a decent purchase and is recommended to buy these if you are looking for affordable weight set in extreme high functionality. 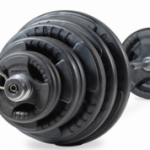 Weight are very affordable because they are traditional old school Olympic plates. Weight are great in measurements and looks. Weight comes in bundles without padding which offer gives some scars and scratches. Weight have a grease on them, also consist of a strong odor smell which is difficult to handle.